SOFAS There are 37 products. Love seat in teak frame. Back cushions: two 40x40, two 60x60 cm. Sofa in teak frame. Back cushions: three 40x40 cm, three 60x60 cm. Sunrise by Driade is a sinuous and elegant sofa. The manufacturing of the backrest, characterised by the explosion of several rays, recalls the rising sun and for this reason Sunrise is the perfect sofa for outdoor spaces. The armrests, with linear and squared shapes, make the structure even more comfortable and cosy. 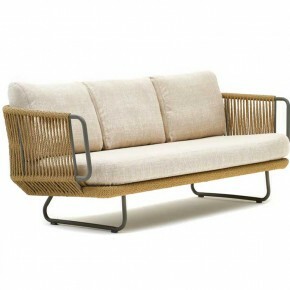 A sofa that talks about…summer!